traditional upholstery using hair, coir fibre, scrim, wadding, to restore and repair stuffed furniture, chairs and sofas. Each new piece of furniture begins with a traditionally hand built frame. The finest English beech hardwood is selected, kiln dried and then cut, shaped, jointed and glued, to ensure that lasting strength is built into every arch and curve. 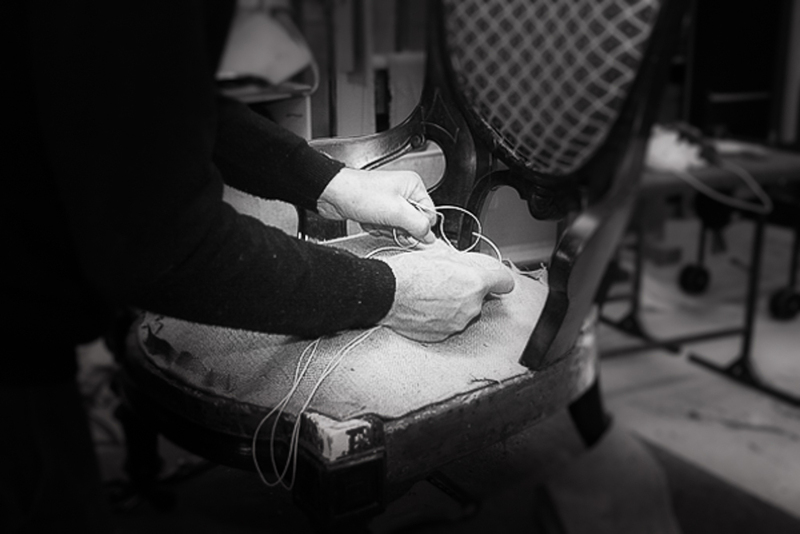 Any show wood is polished, before the frame is passed on to the highly skilled upholsterers. Each period piece that comes to Crowther & Sons for restoration is first assessed to see whether the underlying frame is weak or damaged. The old covering and stuffings are removed; stuffings and wadding can either be replaced or, where the customer wishes to retain as much of the original materials as possible for authenticity, any re-usable parts are carefully cleaned and then re-used. Managing Director, Edward Crowther and his team pride themselves on their ability to listen to their customers, offering advice and inspiration and bringing style and unique quality to every project, however large or small. Steel coil springs are fixed and hand-tied onto a jute webbed base. Natural fillings of horsehair and coir fibre are laid on hessian and finished with specially prepared tailors' felt and cotton wadding. The overall comfort of each piece is of paramount importance and a selection of fillings is available from pure duck down, feather and down to high quality reflex cushions and feather wraps. 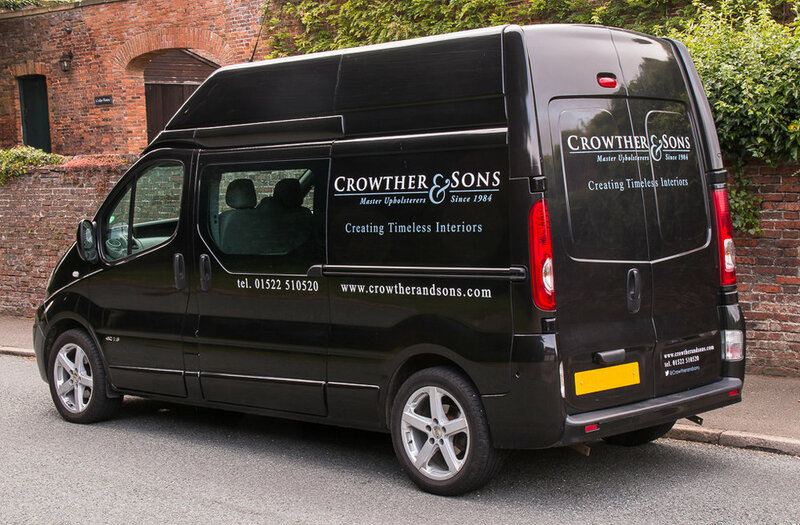 Crowther & Sons offers originality, passion and flair backed up by many years’ experience as master upholsterers. The Company also creates hand crafted bespoke items to meet the specific requirements of clients looking for something special; whether this be rejuvenating old furniture or creating something entirely new. Helping to combat the environmental impact of mass produced furniture is also fundamental and the company aims to use responsibly resourced, non-toxic and environmentally friendly upholstery materials to “up-cycle” both traditional and contemporary furniture. The Crowther & Sons team is happy to travel up to 30 miles from Lincoln to visit residential clients at home and for commercial clients at their business premises. The Company also handles projects throughout the UK and overseas and individual charges for travel and collection/delivery are discussed with clients outside Lincolnshire on an individual basis. Furniture is delivered nationwide and international shipping is easily arranged. Estimates can be provided to renovate existing upholstery and furniture once images are received via e-mail which clearly show the front, side and back of the piece. If you have suffered any loss or damage to furniture Crowther & Sons can provide a written quotation for either its replacement or repair. This service is chargeable but is taken off the balance of resulting work when carried out. Written estimates start from £95 + vat within a 10 mile radius of Lincoln.